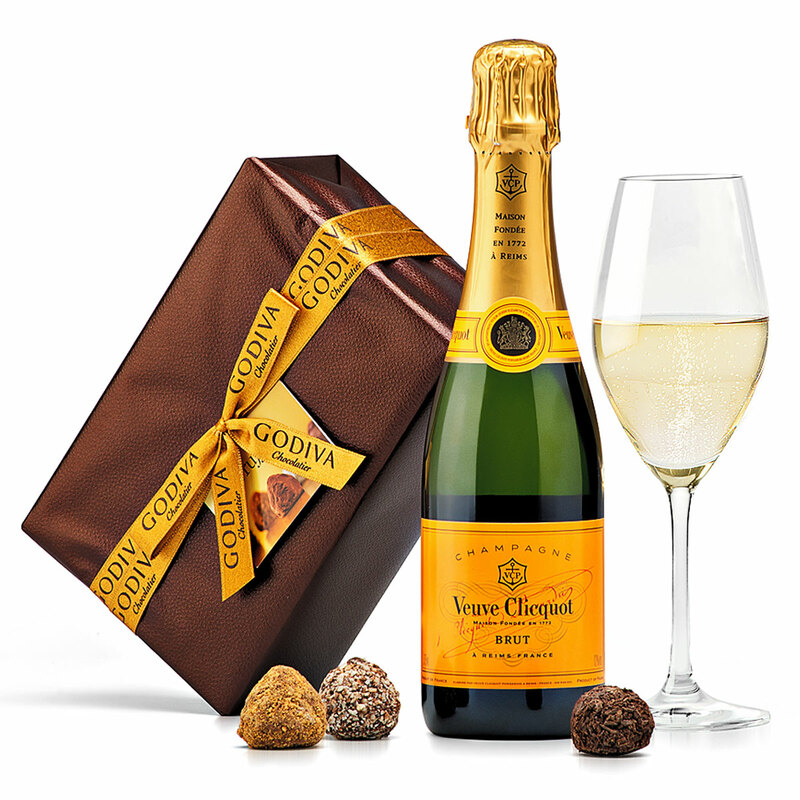 Discover the perfect pairing of Godiva truffles and Veuve Clicquot Brut Champagne. Godiva's Truffle Ballotin offers a treasure trove of chocolate pleasures in mouth-watering flavors including raspberry, sea salt caramel, vanilla mousse, cappuccino, almond, crème brûlée, and speculoos. 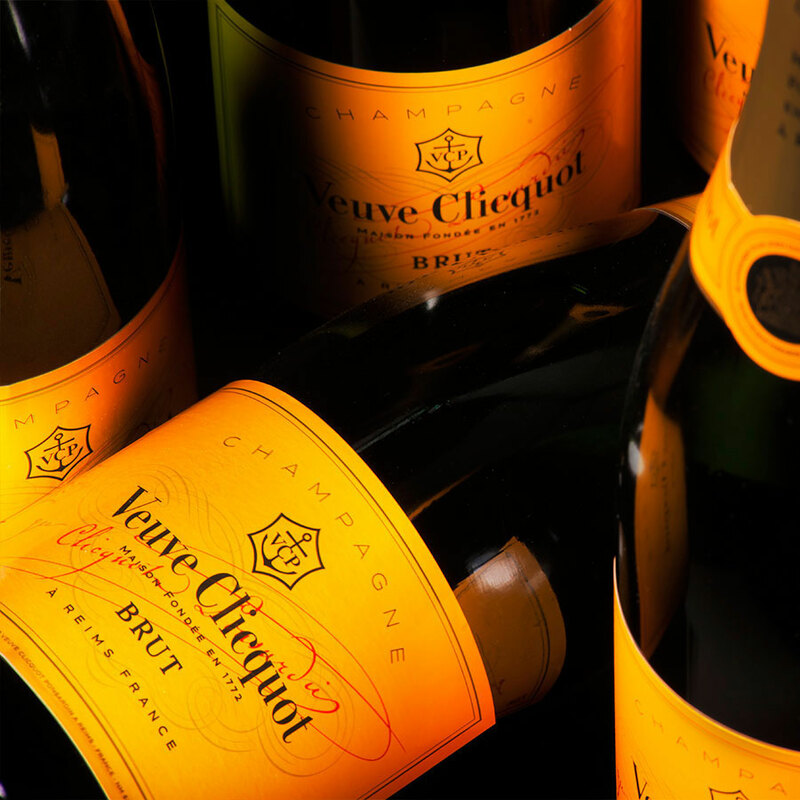 A half-size bottle of luxury Veuve Clicquot Champagne is just right for two to share. Send this memorable chocolate and Champagne gift for birthdays, holidays, romantic occasions, and to celebrate life's special moments. Please note that the glass is not included. Ingredients: Sugar, cocoa mass, full cream milk pwder, vegetable oil (sunflower, palm, rapeseed, palm kernel), cocoa butter, almonds, butter oil, invert sugar syrup, cream, cocoa powder, humectant (sorbitol), glucose-fructose syrup, wheat flour, skimmed milk powder, sweetened condensed milk, butter, apricot, glucose syrup, emulsifier (soy lecithin), honey, flavourings, butter salted, raspberry, hazelnut, strawberry, maltodextrin, coffee, salt, wheat starch, dried strawberries, soy flour, cinnamon, milk protein, acidity regulator (citric acid), natural vanilla.